Land Pride's new SBL25 is a front-mount Snow Blower designed to fit skid steers and tractors with Quick-Attach plates. It is a fully hydraulic unit – auger, impeller, chute, and deflector — and features a 24-in. impeller and 16-in. auger. The auger features 4 paddles to direct snow into the 4-blade impeller to direct the snow into the chute. Skid shoes are adjustable and replaceable. The SBL25 is available in 66-, 74- and 84-in. widths and features 3/16-in. side plate material, and 10 gauge main housing material. FrontPower 540 and FrontPower 1000 award winning PTO systems let you power a standard snow blower up front. No need for a special front mounted version. Delivers up to 180 HP continuous output, with electric-over-hydraulic wet clutch for smooth start and unequalled durability. Available in combination with a LAFORGE front 3-point hitch for most common Utility and Row Crop tractors. Only LAFORGE front PTO systems are backed by 2 year/2000 hour factory warranty from a US company founded back in 1991. Click here for more information, call toll free (800-422-5636) or email lars@fronthitch.com. 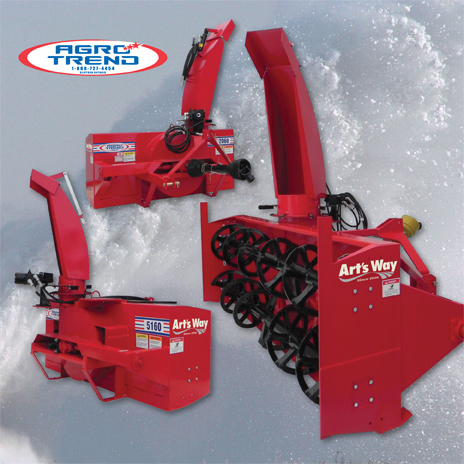 Agro Trend Snow Blowers manufactured by Art’s Way offer power, durability performance and value. 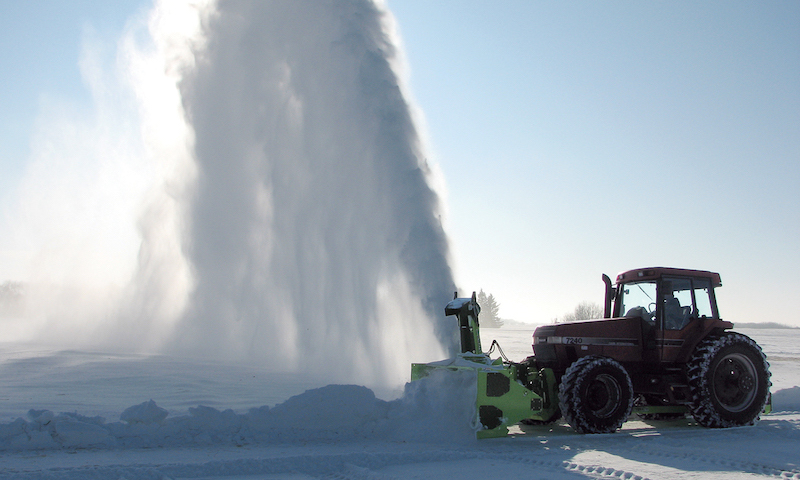 With a heavy-duty auger and large high-speed impeller, Art’s Way Snow Blowers really dig into snow banks. A heavy-duty gear box provides the power to get through huge snow drifts. PTO driven by your tractor. Choose from 28 different models: rear-mounted or pull-behind models from 3 ft., 6 in. up to 10 ft. wide units. Art’s Way Snow Blowers are capable of moving mounds of heavy snow with 5, 6, 7, 8 ft. or whopping 10 ft. wide swaths up to 3 ft. deep. 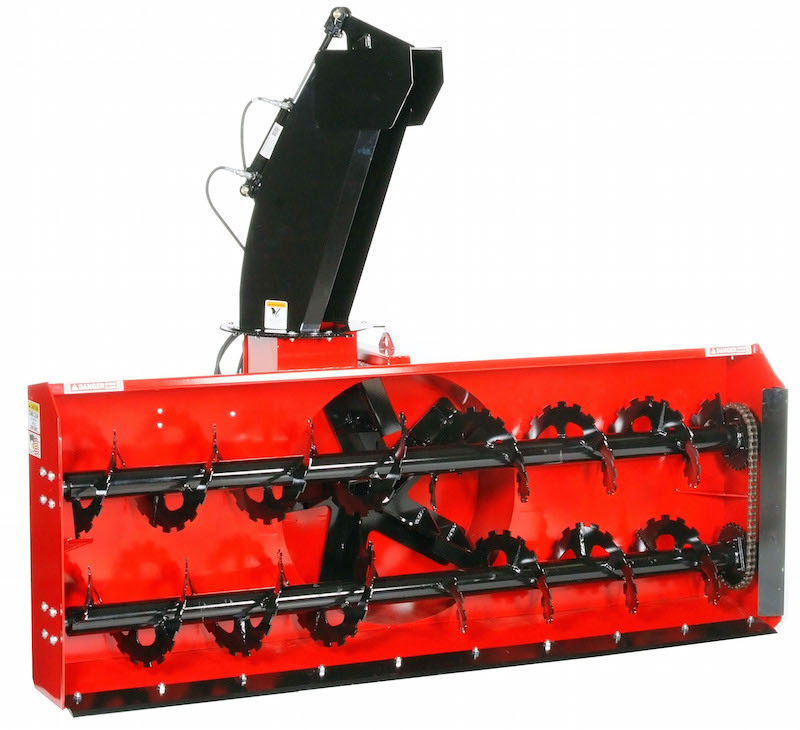 Designed with an open auger and large center auger paddles, the snow blower cuts through even hard packed snow and prevents clogging and build up as it funnels the snow from a 45 degree floor to the center chute. 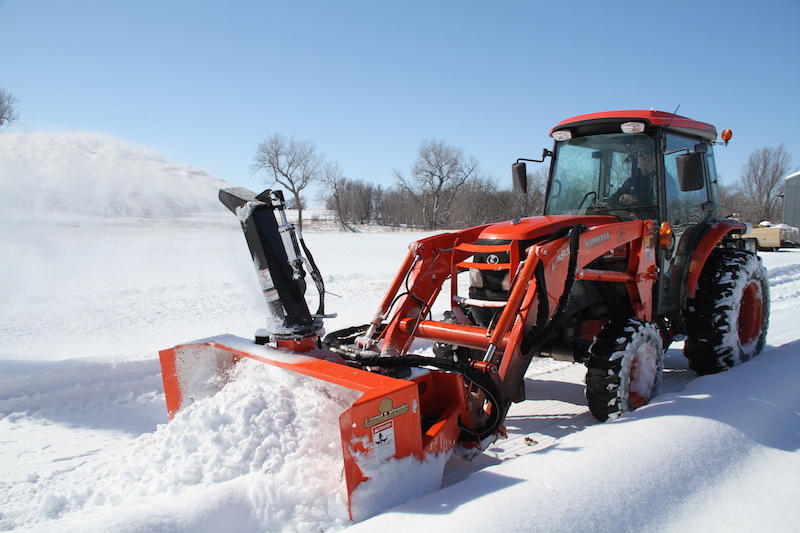 The RDX-117 Snow Blower from Schulte Industries features a rotating drum, which allows snow to be ejected out left or right side or through center chute. 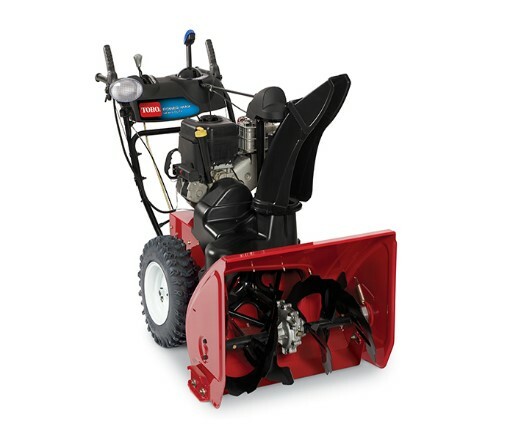 This Snow Blower incorporates a 38-in., five paddle open center cupped style fan, which improves performance and is larger than most competitive designs on the market. A heavily reinforced 23-in. bottom auger with formed struts ensures that hard chunks of snow and ice are fed into the fan with ease and allows the RDX-117 to cut into hard pack snow where other snow blowers have difficulty. For more information on the SDX-117 or any other Schulte product, call (800) 404-6044 or visit us online. 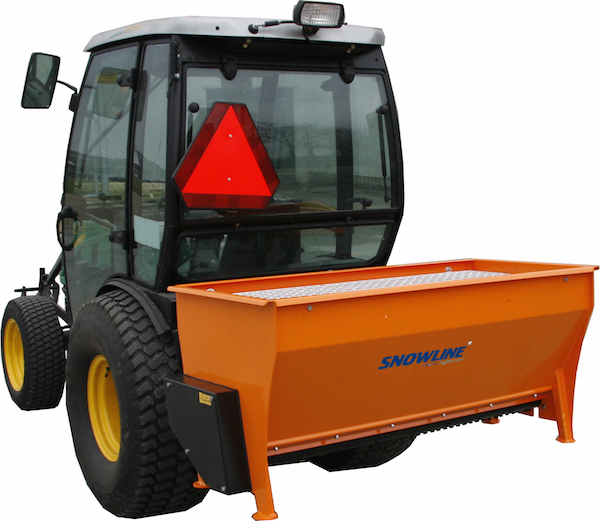 Snowline by Hydromann salt and sand spreaders will handle wet sand, salt or ice melters. With their powered agitator and screw in replaceable cams, Snowline has the most versatile anti-icing spreaders on the market. They are available in mounted, pull type or walk behind models and choice of ground drive, hydraulic drive or PTO driven models. Available automatic rate controllers on hydraulic drive models allow you to save salt by keeping the rate constant regardless of ground speed. Painted or stainless steel models available. The leader in the snow blower industry since 1952 with a proven reputation for offering a quality product for an economical price. Tractor Mounted 1000 – An operating weight of 2200 lb. give you total control to disintegrate the hardest snow. Faster spinning augers deliver more snow to the high capacity 36-in. impeller when utilized on tractors with 150 – 25 HP. Tractor Mounted 540 – The perfect accommodation to your acreage, farm operation or commercial snow removal business. Oil Bath gear boxes, replaceable cutting edges and rugged design assures dependable performance during the toughest winder conditions. Commercial-Grade Auger Gearbox - No shear pins needed so none to replace. Power Steering - Effortless manueverability with the pull of a trigger. Quick Stick Chute Controls - Easily change direction and angle of thrown snow. Sub-Zero material in chute - Special cold-weather material durable down to -104°F - Guaranteed for life.